Students at Henry McLaughlin Middle School join Slider for the Fisher Cats Reading Challenge presented by CCSNH. It's only November, and already nearly 35,000 children have been introduced to the Fisher Cats Reading Challenge, presented by the Community College System of New Hampshire. Those kids represent almost 100 schools that are using the challenge to highlight the importance of reading in a fun way. Fungo and Slider, the Fisher Cats' mascots, are visiting schools and delivering bookmarks with a special challenge. 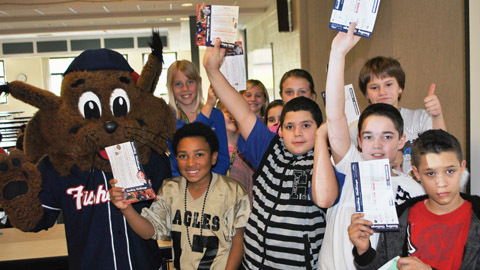 Each student who reads at least five books outside their normal school curriculum will receive a pair of tickets to a Fisher Cats Reading Challenge Night during the 2013 season, courtesy of CCSNH. On the night of their game, they'll be honored during a pre-game parade highlighting their achievements. These students are also representing their schools in a team competition. The school with the highest percentage of participation could win up to $3,000 from the Fisher Cats Foundation. By the end of the school year, the challenge is expected to reach more than 55,000 students in over 150 schools throughout New Hampshire and northern Massachusetts. To get your school involved in the challenge, contact Meg Shea at (603) 641-2005 ext. 102 or mshea@nhfishercats.com.